When it came to deciding on our cake of the month for March we were totally spoilt for choice. That’s not to say it’s usually an easy decision; far from it. We love each and every cake our bakers make on our behalf. Asking us to choose a favourite cake is like asking someone which of their children they prefer or which dancer on Strictly Brucie is most partial to. In a word: hard! But March was particularly hard because each and every cake that came in was worthy of the cake of the month title. There were cakes packed out with sweets; ones adorned with delicate butterflies; a Spring-inspired cake that was so pretty we just couldn’t stop looking at it… but then? Then there was THIS cake – a cake (made for the E8 Community dream drawing exhibition) that looked like an explosion in an art shop. Just incredible. And, as if the outside wasn’t amazing enough, inside there was a rainbow. 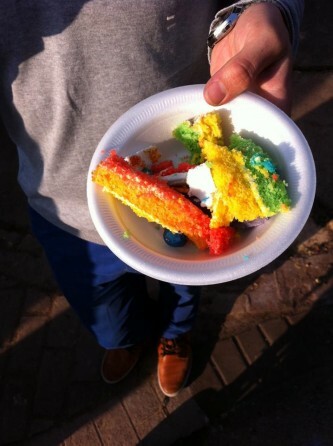 An actual rainbow made out of cake. Sigh. If we could make cakes this good we’d probably set up a cake shop! This baker just bakes as a sideline. Her “real” calling: NEUROSCIENCE! We LOVE our bakers! 1. Preheat the oven to 190°C (170°C for fan ovens), and line the cake tins. 2. Using a hand-held electric whisk or freestanding electric mixer with the paddle attachment, beat together the butter, sugar, flour, baking powder and salt until the ingredients are fully mixed and resemble fine breadcrumbs. 3. Mix together the milk, vanilla essence and eggs by hand in a jug. With the whisk or mixer on a low speed, pour three quarters of the milk mixture into the dry ingredients and mix well, scraping down the side of the bowl. With the mixer on a medium speed, add the remaining milk mixture until the batter is smooth. The batter will be quite runny, don’t worry! 4. Separate the batter evenly into six different bowls. If you want to be super accurate, measure out the batter. Colour each bowl with one of the gel food colours, the colour of the sponge won’t change much once it’s cooked so be brave and make them bright! Once coloured, take three of the colours and spoon each of them into the three sandwich tins, making sure the surface is even. Pop the three tins into the oven and cook for approximately 25 mins. They might need longer, so before taking them out, make sure a skewer comes out clean, and the sponge bounces back when lightly pressed. Once the cakes are turned out on a cooling rack, repeat with the final three colours. 5. To make the buttercream icing, whisk the icing sugar with the butter on a low speed until fully combined and sandy in consistency. The longer, the better. Add the vanilla essence to the milk and slowly pour into the butter and icing sugar while still mixing on a low speed, then increase the speed to high and whisk the frosting until light and fluffy. I find that often not all of the milk mixture is needed, so add it slowly, judging yourself when the icing is a correct consistency. Also be careful not to over mix the icing once the milk is added, as it might split and not set hard enough to support all 6 sponges! 6. Assemble the cake. In rainbow order, stack the six sponges with a good amount of icing between each layer. 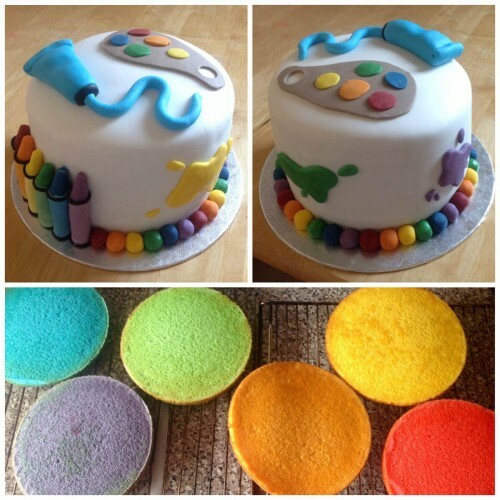 Once assembled, cover the cake in a thin layer of icing using a pallet knife (this will pick up any loose crumbs, giving the cake a clean finish). Wash the knife, and then add a second, thicker, layer of icing around the top and sides of the cake. If you are covering the cake in fondant icing, then skip the thick layer and just add the fondant icing to the cake with the thin layer of butter icing. Decorate as you wish. 7. 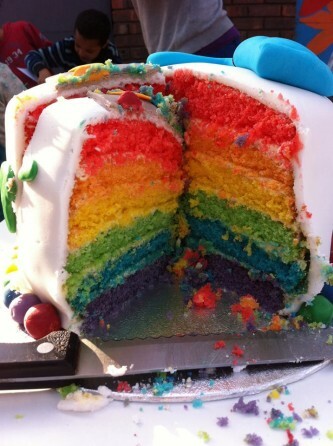 Eat and enjoy the rainbow-y goodness! Hello! I’m Beth, a 21 year old who recently graduated from a neuroscience degree. I’ve always loved having creative projects alongside my studies to balance everything out a bit, and baking was a favourite of mine because it made a good treat for me and my housemates when we were desperate for a break during our finals! I decided to bake for FCFK Hackney because I wanted to be able to practice my cake making and decorating skills for a great cause. I love challenging myself with cake ideas, and hope that the final outcome is loved just as much by the kids themselves!